I'm curious to see if older Wii U games that didn't sell that well (such as Tropical Freeze) will also see some increase in sales after MK8's predicted bump. You can still find the bundles with Wii Party/NSMBU so I think most people will be satisfied with them. Of course, they're no longer in production and will eventually run out, which means the new 'Wii Sports Club' bundle will become more prominent, maybe. I think the biggest problem in luring in potential consumers is that the only titles with release dates after Mario Kart are One Piece Unlimited World R, Kamen Rider, and a special edition of MH Frontier. Suddenly everyone knew and had seen that PS4 would be such a sales disaster in Japan. Do you have a prediction for Mario Kart 8? Would be interested to hear it. I wonder if Sonic Transformer Racing will sell on the hype for MK8. Not much, but better than it would have normally sold. Proooobably not. Sonic Racing Transformed is currently 34th place on Amazon.jp's Wii U chart, currently being outsold by third party sensor bars, USB microphones and ZombiU. Wait, the NSMBU/Wii Party U bundles were phased out in favor of the Wii Sports Club bundles? They didn't even put in full versions of Wii Sports Club and clearly nobody is buying that bundle..
Is it higher on the PS3 chart by any chance? I didn't realize it was a multiplat release in Japan.. I guess Just Dance Wii U will join the exclusive "selling over 50K in Japan on Wii U" club soon, which only 13 titles have hit so far. Then again, there are only 35 titles listed on japanltdrank. I thought that they did, anyway. It still says it's a unit-limited set on Nintendo's site, but it doesn't say discontinued like the MH, DQX, and original Premium sets. The Wii Sports Club thing is potentially confusing; you get the 'Lite' version of the game installed, but it can't connect to the net for online play. You can get the online version for free though, if you connect your console to the net and set up a NNID. Ok, so Persona Q is above Shin Megami Tensei. I'm starting to think a +200k opening for this Persona spin off is completly possible. Mmm, that seems kinda high though. It's still below P4G, which I believe opened around 150k. A bit better on PS3, yeah. Currently 25th place. The high price tag certainly isn't doing it any favours either, it's a fair bit more expensive than Mario Kart 8. Could be wrong, but with COMG is not good to compare games from different platforms. The post I'm quoting below shows exactly why it's not even that useful on the same platform. Soul Sacrifice had a better first week than Toukiden with 100 fewer preorders at comgnet according to these #s.
That seems pretty silly all things considered. This is the first time they've tried releasing the franchise there, Sonic isn't even popular in Japan anymore, and they're pricing it higher than MK8, which releases 2 weeks later? Seems like a recipe for disaster. One Piece is decent at least even if it is a port. Hopefully E3 will provide us with some release dates for games. I still think that the earliest we'll see a Wii U game from Nintendo after MK8 is July (aka Hyrule Warriors or Bayo 2). Because comparing different IPs even in the same platform is not a good idea either. I know Shin megami tensei and SMT: Persona are not exactly the same IP, but same univers. Only reason why I need a PS4 is cause of FF and MGS and even then, a part of me wants a PC release for XV and MGSV so I don't have to get a PS4. Otherwise, I'm content with my Vitas. This strikes me as a little bit revisionist. Perhaps a few people were predicting it to drop below Wii U on a weekly basis this soon, but it couldn't have been many. That certainly wasn't the consensus, even after the lineup was known. I never said a lot of people were predicting it, ever. The logical posters here are a small minority. It really was never hard to predict. Why do so many people think the logical prediction defies logic? It would be ideal if people just stopped with the dumb generalizations. "Everyone" thought PS4 was going to save Japan. "Everyone" thought PS4 was going to tank. "GAF" this, "GAF" that. There are thousands of people with different opinions here, fanboys of all companies. Whenever you, who is reading this, think "GAF" favors something, odds are you're simply projecting your own bias, focusing on one side while ignoring everything else on the other. You have read my post entirelly wrong. It's not about "GAF", it's about moving goalposts from many here, same thing that will happen with Mario Kart 8. Sure I have and I have given it. Sticking to handhelds? Their output on handhelds is just as atrocious, in fact I would call it worse. P4G opened at 137k iirc. Depends on how hard Nintendo pushes Lightening Rosalina. Damn. Rosalina has lost some weight since MK7, good for her! Falcom, Marvelous and Nippon Ichi financials are out I see. Anyone can translate? Shinobi is reporting Wii Sports Club is coming to retail (with baseball and boxing) on July 17th, for 3,700 yen. Actually, I would argue that comgnet works better when you compare similar titles relased on the same console, so in this case the comparison with SMTIV pre order numbers would be more telling. Still can't believe how they've handled the original wii's flagship game. That's huge problem. Consoles need to have economy of scale working for them to get space in shops. If western market for handhelds keep shrinking at current rate we might get into situation where handhelds can only be bough at few specialised shops and online and games will be digital only and what worse translating of jrpg or other text heavy games might become unprofitable. did SEGA not know MK8 was coming? Really Comgnet only works well when comparing the same franchise. You know what Atlus should do? Have a Persona 5 trailer unlock if you beat Persona Q with both games. Too bad Nintendo would never allow it... unless it was also coming to Wii U, which it isn't. How would Nintendo stop them? Not saying we should use it, but keep in mind Soul Sacrifice had hardware bundles + double pack. And keep in mind how small was Vita's fanbase. Smaller base = less preorder potential. Both Toukiden and God Eater were released later and on a (kinda) bigger install base. Soul Sacrifice started building the hunting action audience con the platform. The rest appeared when other games already started building it. So, even if Whatever JRPG franchise "2" has better preorders, it could end up selling as much as the first entry even if preorders are higher, since the audience is already there. Aren't you the one that's been pushing the rhetoric of PQ being nothing more than an Etrian Odyssey game with a Persona skin? So given where you stand, wouldn't the EO games be the best comparison? I'm not sure there's an accurate comparison myself. A Persona spinoff on a Nintendo platform using EO game systems? Eh. It's interesting contrasting its Comgnet preorder trajectory to the other games it obviously draws something from, though. Come on, do you really think Nintendo would allow Atlus to advertise a game meant for the competition in a 3DS game? I was talking about putting the trailer on the cartridge, not just unlocking it on a 3rd-party website or anything by the way (sorry if it that wasn't clear). I believe they did that for Shin Megami Tensei IV. Well PQ is EO with a Persona skin but that doesn't mean it won't attract some Persona fans, after all its called Persona Q. I'm sure there are many Persona fans who have never played an EO game or have never wished to but will buy PQ. There's not much reason to assume they wouldn't, unless they've blocked videos like that in the past. Come on, do you really think Nintendo would allow Atlus to advertise a game meant for the competition? I was talking about putting the trailer on the cartridge, not just unlocking it on a 3rd-party website or anything. S-E included a brochure for Star Ocean 4 inside of Star Ocean 2 PSP. At that time the platform of the game wasn't known, though. Sure, but there are also Etrian Odyssey fans that will be attracted to the game systems where it draws from. Map drawing, F.O.E.s, etc. You could also argue that there are aspects of the merging of these two series that could potentially turn off a good portion of the respective sides of each fanbase. I've read about Persona 3/4 fans writing the game off because it's in first person and has map drawing, for example. Case in point, I think Persona Q, by merging aspects of both series is probably its own unique thing and I'm interested in seeing how that translates in sales; hopefully Media Create gives us some statistics about which fanbase is predominantly buying the game. And whether there are new buyers entirely in the mix (which is possible with this being the first Persona game on a Nintendo platform). Doubt that Atlus would be interested anyway, the 3DS screen and it's resolution are probably not the way they wanna show Persona 5 for the first time to the public. Mario Kart 7 seems to be slowly climbing up the charts. Wonder if it's all because of MK8 anticipation? Just like how MKDS got a boost when MKWii released, I can see 7 getting a second wind. The thirst is real. MK8 is going to be huge. Isn't it just because of the Golden Week? I don't remember MK7 charting off until the previous week. Though it'd be nice if MK8 ould also boost MK7 sales. Sonic Racing, on the other, is definitely gonna bomb like there's no tomorrow. I already said it when it was announced, but SEGA really got to be dumb... especially since the announcement came AFTER the investor meeting where Iwata said the game would launch in May. the ps2 didn't need to focus on games that would be considered 'casual' titles in later generations- the dvd playback ensured widespread appeal despite it being a video game machine. that's a big distinction between that and the xbox 360, which built its appeal primarily as a video game player, and why i see the playstation 4 as closer to that system. the early library on the ps4 is also a lot closer to the 360's versus the 360's and ps2's. also the ps2 wasn't the lowest-cost 'core' system of its gen. the ps2 was always more expensive than the gamecube and dreamcast. I'm using the term in the same way NPD is using it for the most part. DVD playback was a good value add. I don't know how accurate it is to say that it wasn't selling primarily as a video game player though. It managed a large attach rate despite the largest installed base of all time. Essentially all I'm saying is that the 360 took the bulk of the US audience that bought the PS2 in the 6th gen, the TTM unit sales have remained mostly flat save cyclical peaks and troughs for a good 10 years. I'm predicting 300-350k units for MK8 and 55k Wii Us sold on the opening week. PS4 hitting sub 10k before the WiiU? Vita's not looking too great either. I wonder what's keeping the 3DS sales up there, doesn't seem like it's mario golf, that 3DS LL promotion maybe? Wii U line-up prediction? Wii U line-up prediction. 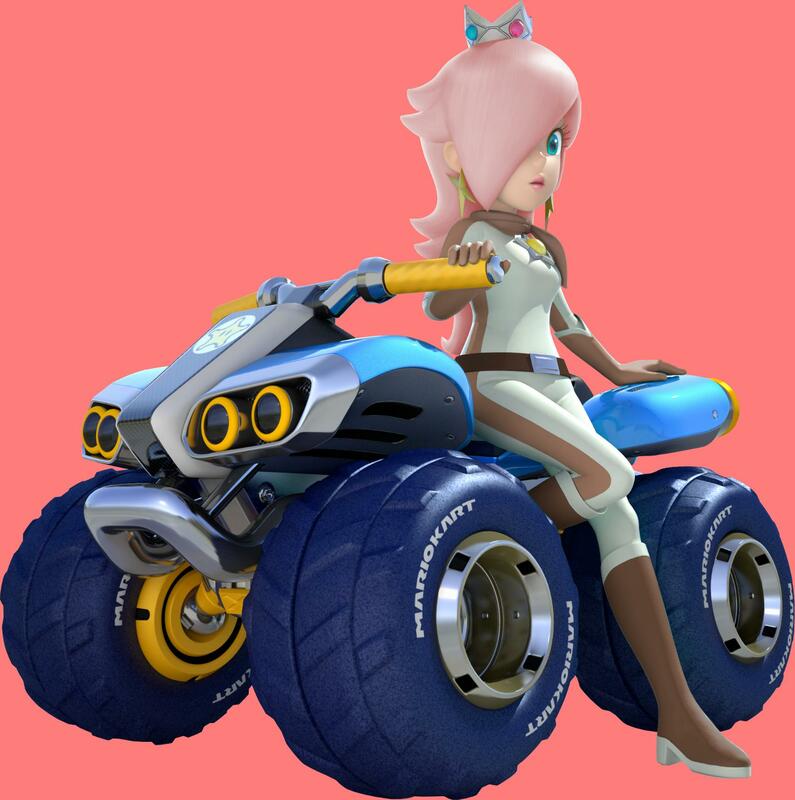 June has Mario Kart DLC Believe!